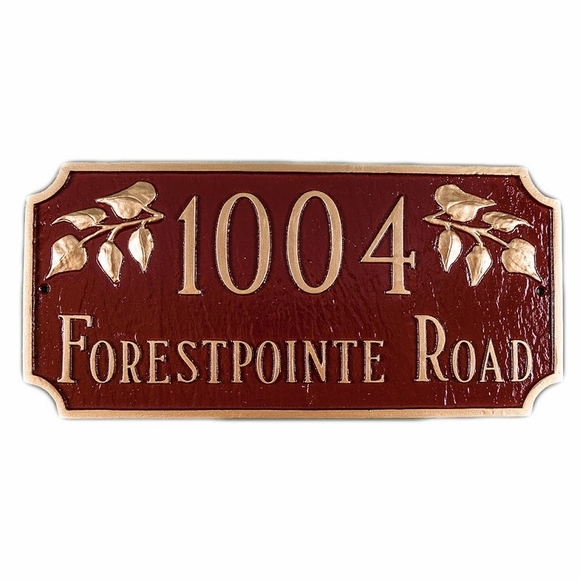 Personalized Address Sign with Ivy - - leaf accents that frame and highlight your house number. 15.75"W x 7.25"H rectangle sign features decorative cut-out corners. Designed for two lines of personalization. Made in USA. Holds up to five (5) 3" numbers on Line 1 and up to seventeen (17) characters on Line 2. Hand cast in rust resistant aluminum. Lawn signs include two stakes. Wall signs include mounting hardware. Personalized cut corner rectangle address plaque with graceful ivy accents. Made in USA.